Food... like fashion, design or decor... is fluid. New discoveries... new flavors... are always forthcoming and celebrated. And yet, it is that very fluidity that oftentimes brings you back full circle... re-worked, re-tooled, re-created... where the core of what is revered remains intact. I've never been a huge fan of chicken pot pies. I like them, sure enough, but rarely did I find a crust done well enough to warrant the inclusion of all that dough... certainly not before dessert. More times than not, the crust in pot pies overpowers the essence of the pie... what's inside. Like most anything, it really comes down to personal preference. I like my pie dough to surround a bubbly, fresh and fruity filling. Given this liking, I've made my savory pot pies "naked"... as in the filling kind of stands on its own... savory, seasoned and soothing. I always loved that the crust... basically a wafer-thin disk of buttery, golden puff pastry... simply lay atop a bowl of tender chicken and veggies nestled in a delicious, yet simple broth. 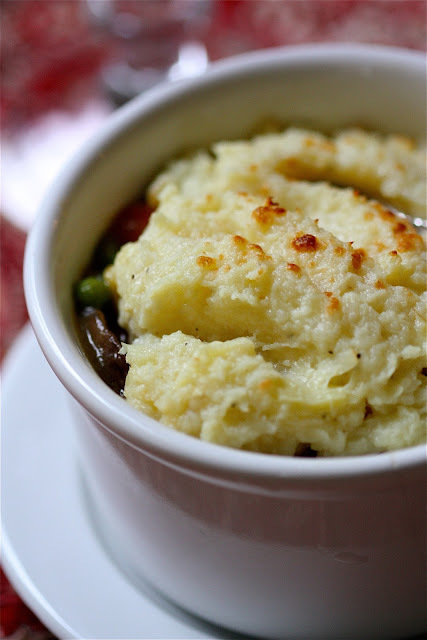 Then, I decided I actually preferred a mashed potato cap atop these bowls and did away with the crust altogether... more a la Shepard's Pie than Pot. And then, again... as we've moved more and more towards a vegetarian diet, I re-worked, re-tooled and re-created this classic to fit our current day preferences. And that's where this recipe came to light. Mushrooms, particularly shitake, are a great substitute for poultry. They are meaty, flavorful and satisfying. They offer a sense of satiation that I think is sought after in vegetarian fare. Together with onions, carrots, celery, peas, and corn, you have the makings of a great filling. And, rather than going the mashed potato route, I opted for a parmesan-parsnip mash to crown the top. Parsnips are a wonderful alternative to potatoes. And with a good sprinkle of parmesan they are only that much more enchanting. Much of what is satisfying, inspiring or revolutionary is simply a re-creation of a classic... even if just from a bit of its core. Classic is... classic. Self-defined. Set a large pot of water of lightly salted water to boil. Add diced parsnips and cook until fork-tender, about 10 to 15 minutes. Drain and set aside. Meanwhile, heat olive oil in a skillet over medium heat. Add onion, celery and carrot; sauté until onion is translucent and carrot is fork-tender, about 8 to 10 minutes. Add mushrooms and continue to sauté until golden, about 5 to 7 minutes. Add peas and corn and sauté until heated through. In a small bowl, mix cornstarch with about 1/4 cup broth; whisk until combined and add to skillet. Stir in remaining broth and continue cooking until broth thickens just a bit, about 8 to 10 minutes. Remove from heat and set aside. Return parsnips to original pot set over low heat; add milk and butter. Mash by hand or with submersion blender. Add parmesan cheese and season with salt and pepper, to taste. Set aside. Rewarm mushroom mixture, if needed. Divide mixture among four small ramekins or single serving oven-safe bowls (approximately 1 1/2 cup in size). Top with a large dollop of parmesan-parsnip mash. 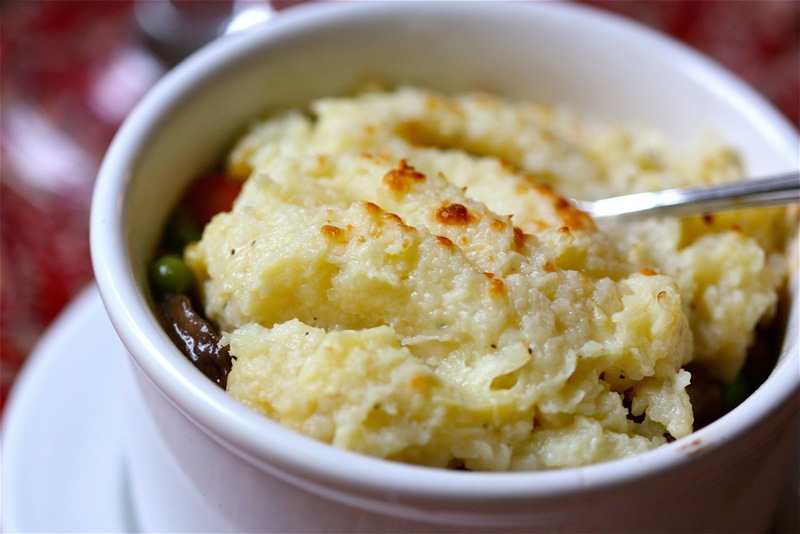 Sprinkle with additional parmesan and place under broiler to set a golden tinge to cheesy mash. Watch closely to avoid burning. Serve hot.